Long revered at this point for their ability to bring some jazzy, tech-inspired death metal in ways that are frequently unexpected, there’s always a question of where the next Gorod album will go. While they tend to relegate their most experimental stuff to EPs (such as the recent thrash-based Kiss the Freak), Aethra was announced as deliberate in a hasty songwriting process to promote spontaneity. Given the complex nature of the band’s past, it’s understandable that the announcement may have shook some of the band’s most devoted, but rest assured, Aethra holds to the high-water marks the band has always provided. Upon first listen, one may notice that yes, it’s not quite as overtly complicated as the last album, A Maze of Recycled Creeds. However, it’s still Gorod and packs plenty of frenetic and jazzy/tech infusions over the course of the album. Some headspinning stuff ensues on “Hina” and “Goddess of Dirt” as the band ups the tempo and fires off some intricate riffs that are as flashy as they are catchy. Which brings us to the main upgrade of Aethra when compared to previous material – there’s a surprising number of hooks to bite into. The opening trio of “Wolfsmond,” “Bekhten’s Curse,” and the title track showcase a melding of the band’s traditional use of groove with some atmospheric and melodic components. This more varied playground gives vocalist Julien Deyres more opportunities to dive into a range of extreme vocals (and even some clean ones, tastefully done of course). This is undeniably catchy stuff, such as “The Sentry” showcases at its most melodic, but the way Gorod can shift back into explosive speeds with a snap of the fingers is where it becomes most impressive, as said track’s latter half executes perfectly. 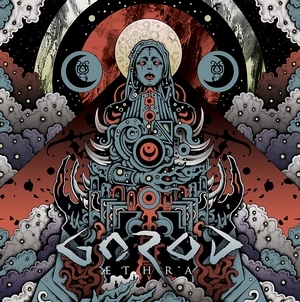 Lastly, despite the changes, it’s also still very clear that it’s Gorod steering the ship, due to their personal stamp and riffing structures – listen to only a few seconds of “Chandra and the Maiden” or any track for that matter and you can simply here it. 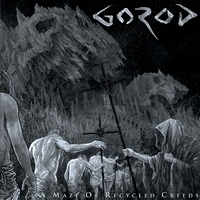 While it may be Gorod’s most accessible release to date, it may also be one of their best. We all know they can play dizzyingly technical stuff, and it takes a true musician to knowingly alter the formula to see what they can do under different conditions. This is why Gorod are consistently on the short-list of the genre’s most talented players.